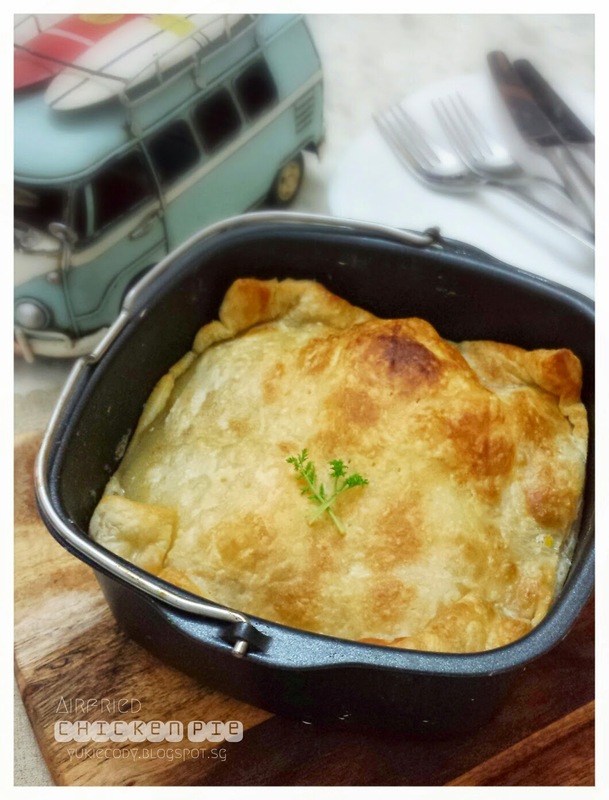 I always find it quite a chore to make chicken pies as you need to make the dough, cook the filling and bake it. 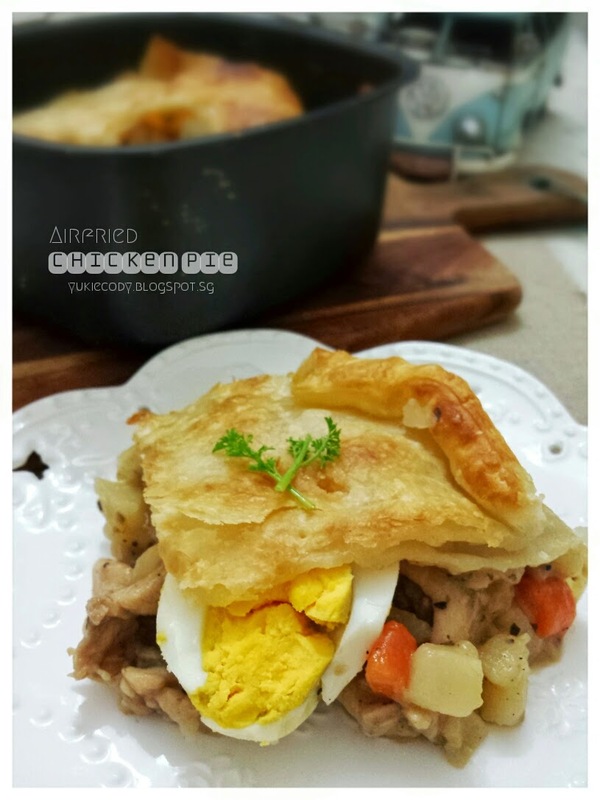 But with the help of the puff pastry sheet and air-fryer, things seem more manageable ;) Here's a good recipe shared by Chelsia. 1) Season the chicken cubes with light soya sauce and pepper. 2) In a pan/wok, saute onion and add in carrot and potatoes.Add some water to cook the vegetables followed by adding in chicken cubes and mushrooms. 3) Add in salt, black pepper, dried herbs, garlic powder, worcestershire sauce. 4) When the chicken cubes are cooked, sprinkle some plain flour and stir well. Pour in some milk and simmer for the vegetables to be soften. 5) On a non-stick baking tray (of Philips air fryer) lay 1 piece of Pampas puff pastry sheet as the pie base, use a fork to gently poke some holes. 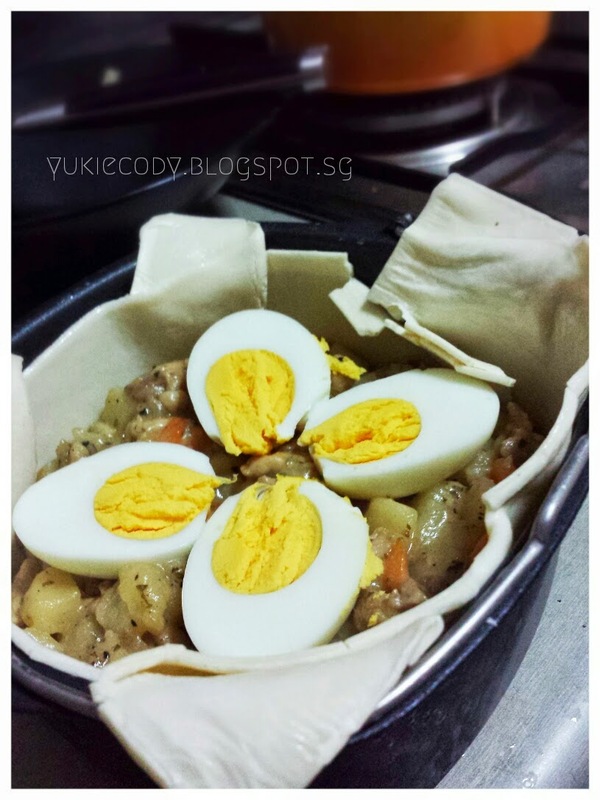 6) Pour in the cooked filling and arrange the eggs on top. 7) Trim off the edge excess to make it neat. Use a brush to glaze the edges of the pastry with melted butter. 8) Cut the 2nd piece of puff pastry sheet to desired size enough to cover the top, I used a fork to press down the edges a little and poke some holes at the center. 9) Brush the top with melt butter and airfry at 180 degree for about 6 mins or until it form golden brown. You have not specified to use temp. in C or F. Very Important. Thanks! Hi, it is degree Celsius. And the appliance used in here is an Air Fryer.